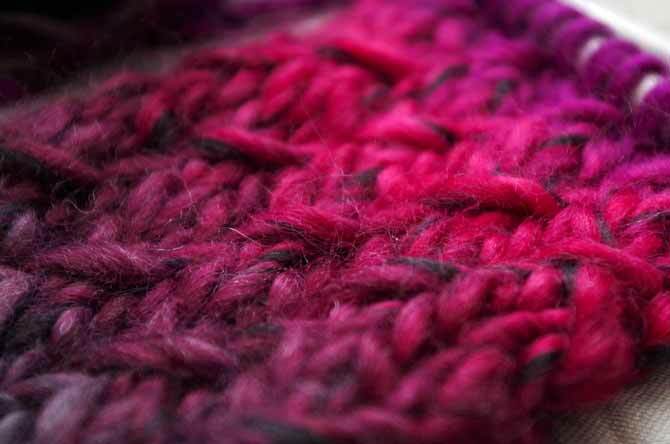 When I knit with yarn that is dyed with long color repeats, I really try to find ways to “drag” the color up across rows, or at least across stitches — I like the way it adds to the blending of the colors. After lots of swatching, this time I came up with this pretty cowl. 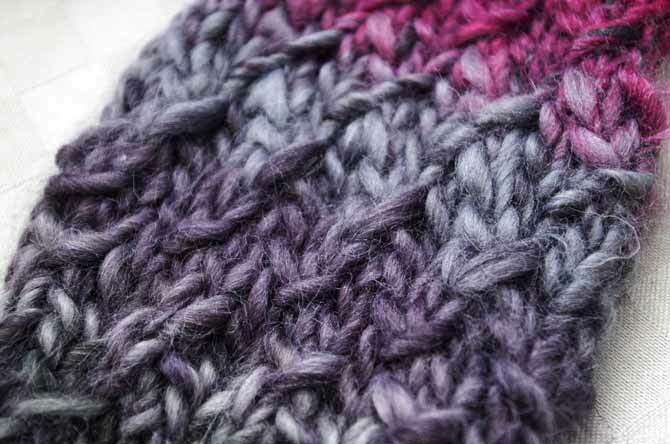 I used several different methods to create lifted-stitch textures in this swatch. This swatch is full of errors. I was trying different stitches, and it made for some interesting shifts in total stitch counts, irregular lines, and twists in stitches — basically, a hot mess — certainly nothing I could use as a finished item. One thing that you don’t get to see as a blog reader is the time and the processing it takes to write a blog post. The swatching took place two weeks ago. On the weekend, I wrote the pattern for the cowl and started knitting it — in 90 degree heat. Once the knitting has finished, the posts go through editing, then on to production to be posted for your reading pleasure. Tonight is knit-night and this cowl is the project I’m taking. I hope to have enough done to give you an idea of what it looks like. To you, the picture you’ll see at the end of this post is only a few seconds away, but I’m trying to find a cool spot to knit like the wind so that I have something to show you. 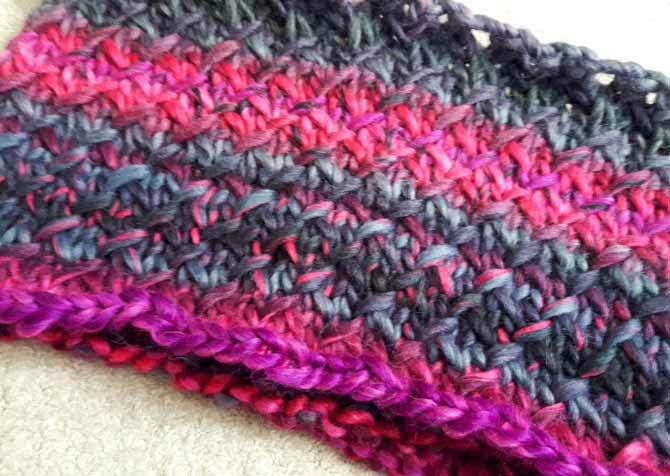 To knit this cowl, you’ll need one skein of Classic Shades Big Time in the Stravinsky colorway. I’m using size 12mm needles. I happen to have a circular one, so I’m knitting this in the round, but the instructions are for knitting on straight needles (you could use size 8mm, size 10mm, size 12mm, or size 15mm as gauge isn’t important) in case you can’t find a circular one. Cast on 72 stitches (or any multiple of three that gives you the circumference you’d like for the cowl). 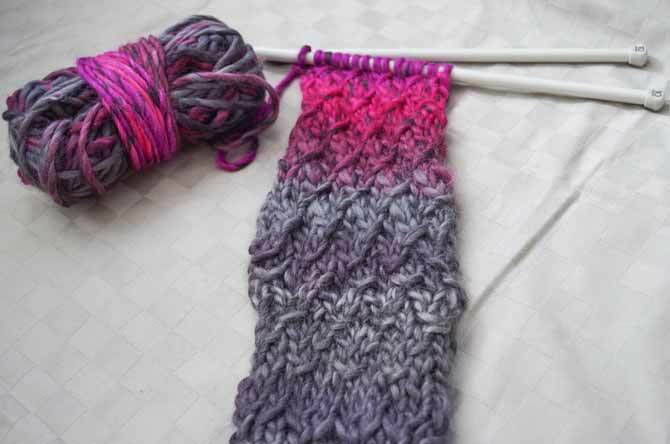 TIP: Measure off two or three arm lengths of yarn and tie a loose knot. Work a row to determine how much yarn you need for a row, and reserve double that for your cast off. k = knit; p = purl; sl = slip; ssk = slip each of next 2 sts knit-wise, return both to LH needle, knit together through back loops; st = stitch; LH = left hand; RH = right hand; tbl = through back loop; lifted increase: insert RH needle under first leg of st below next st on LH needle and lift loop onto LH needle, knit this loop; [ ] repeat between as instructed. Row 1: K2, [pass 2nd st on LH needle over first st on LH needle, K1, K1 tbl, K1] across, K1. Row 2: P1, [sl 1, p2] across, sl 1 p1. Row 3: K1, [ssk, work 1 lifted increase, k1] across. Row 4: [Sl 1, p2] across. Row 5: K1 [pass 2nd st over first st on LH needle, K1, K1 tbl, K1] across. Row 6: P3 [sl 1, p2] across. Row 7: K2 [ssk, work 1 lifted increase, k1] across, k1. Row 8: P2, [sl 1, p2] across, p1. Repeat rows 1 to 8 for pattern until yarn almost runs out ending with a RS row, leaving enough to cast off and to sew ends together. Cast off purlwise. Knit Night was a success! Here’s the cowl all done with one skein. I didn’t get to go to Woodstock this year, but I heard it was lovely, with lots of nice yarn. I hope you have some multicolored yarn to try this technique.